Dave Grogan was born in Rome, New York, and raised in Cleveland, Ohio. He studied accounting at the College of William & Mary in Virginia and later attended law school at the University of Virginia. He is a licensed attorney in the Commonwealth of Virginia. After law school, Dave joined the Navy and served on active duty for over 26 years as a Navy Judge Advocate. During his career, he prosecuted and defended court-martial cases, traveled to capitals around the world, lived in Japan, Cuba and Bahrain, and deployed to the Persian Gulf onboard the nuclear powered aircraft carrier USS ENTERPRISE. Dave’s Navy experiences influence every aspect of his writing. Dave’s current home is in Savoy, Illinois, where he lives with his wife, Sharon, and dog, Marley. Read Dave’s Long Bio here. What is Sapphire Pavilion? Learning the answer may prove fatal. 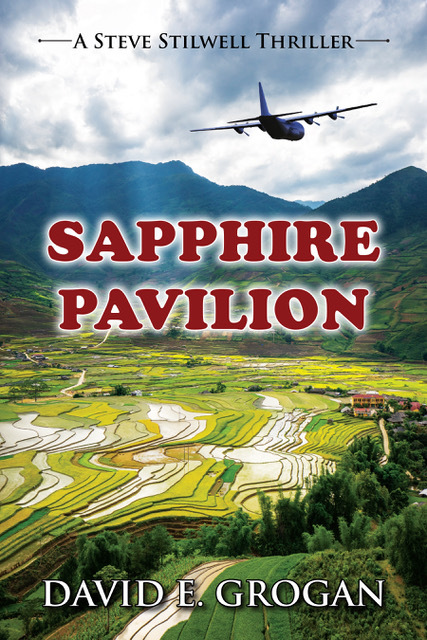 On May 1, 2017, Camel Press will release Sapphire Pavilion ($15.95, 280 pages, 6×9 ISBN: 978-1-60381-603-8), by David E. Grogan, Book 2 in a series featuring retired Navy-JAG officer and Williamsburg, VA, attorney Steve Stilwell. Steve travels to Vietnam to free a fellow ex-Navy JAG from jail, only to stumble onto a deadly secret. 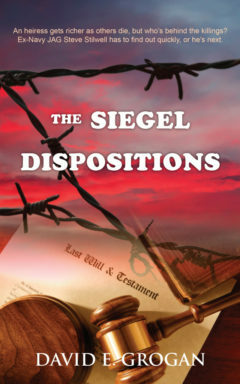 Book One, The Siegel Dispositions, will be reprinted as part of the Harlequin Worldwide Mystery series. Steve Stilwell’s former Navy JAG Corps buddy Ric Stokes has been jailed for possession of heroin in Vietnam. He was found in the same room with his traveling companion Ryan Eversall, who died of an overdose in the company of a prostitute. Steve knows his friend is a straight arrow. Was he set up? If so, for what reason? Steve travels to Ho Chi Minh City in search of the truth. In no time Steve is targeted by the people who framed his friend. A beautiful young American businesswoman insinuates her way into the case. Can she really help, or is she just a dangerous distraction? Ric and Ryan came to Vietnam in search of an Air Force transport plane that disappeared in 1968. The pilot was Ryan’s father. Before the heroin bust, they had located the wreckage. Ryan’s notebook, which Steve manages to obtain, spells out the exact location. Ryan’s widow has given Steve’s associate Casey another piece of valuable evidence, a file labeled “Sapphire Pavilion.” Someone is willing to go to any lengths to steal both the notebook and the file. From Virginia and Texas to DC and Vietnam, powerful, all-seeing forces with unlimited resources are determined to bury the truth about Sapphire Pavilion. But they have grossly underestimated Steve Stilwell and his associate Casey, a former Army pilot who lost her leg in a helo accident. And the ability to inspire loyalty wherever you go can come in handy when danger lurks behind every corner. David E. Grogan was born in Rome, New York, and raised in Cleveland, Ohio. 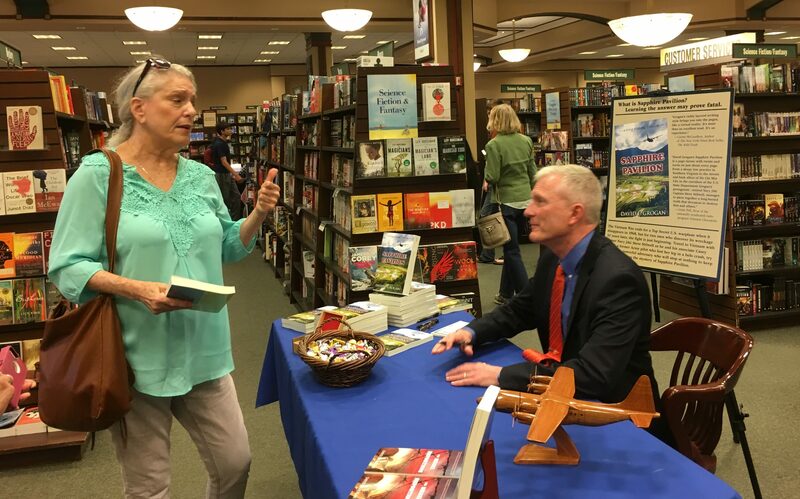 A certified public accountant and an attorney with a master’s degree in International Law, Grogan served on active duty in the U.S. Navy for over 26 years as a Navy Judge Advocate. His experiences abroad and during the course of his career influence every aspect of his writing. Grogan currently resides with his wife in Illinois. They have three children. 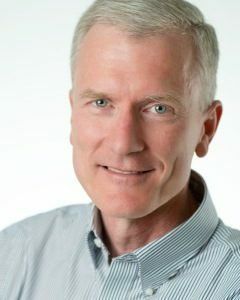 You can find Grogan online at www.davidegrogan.com. Sapphire Pavilion is currently available for pre-order on Amazon.com. After May 1st, it will also be for sale in both eBook and 6×9 trade paperback editions on BN.com, the European Amazons, and Amazon Japan. Wholesale orders can be placed through orders@epicenterpress.com, Ingram, or Baker & Taylor. Libraries can also purchase books through Brodart Company. Other electronic versions are available from Kobo and iBooks. ABOUT Camel Press—Based in Seattle Washington, Camel Press is a new imprint owned by Coffeetown Press. Camel Press publishes genre fiction: romance, mystery/suspense, science fiction, horror … or any combination thereof. We publish the books that grab you and hold you in their grip long into the night.